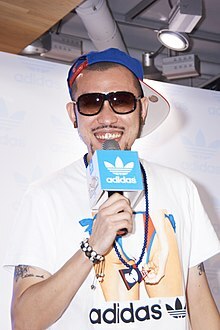 MC HotDog (Chinese: 姚中仁; pinyin: Yáo Zhōngrén; Wade–Giles: Yao Chung-jen; born 10 April 1978, Taipei) is a Taiwanese rap artist known for his use of explicit lyrics in his songs and for his two famous hits - "我的生活" (My Life) and "韓流來襲" (The Korean Invasion). In 2001, his four mini-CDs sold over 220,000 copies. In 2004, he toured with Chang Chen-yue in the North American Kill Kitty tour. In 2006, MC HotDog released an album Wake Up, which contains hit song "我愛台妹" (I Love Taiwanese Girls). "我愛台妹" is currently featured in a commercial for Kuang Chuan Tea Time. It sampled Glenn Frey's "The One You Love" and The Spinners (American R&B group)'s "I'll Be Around". The track won Best Karaoke Song at the 2007 HITO Radio Music Awards, presented by Taiwanese radio station Hit FM. Wake Up was both a critically acclaimed album as well as a commercial success, as it provided MC HotDog with crossover appeal. In 2008, MC HotDog released a new album called Mr. Almost. This article about a Taiwanese singer is a stub. You can help Wikipedia by expanding it.